This sounds like an April fool’ss joke, especially the part of putting 5000 bees to sleep, then shaving (some of) them, putting a sensor on their back, and letting them fly again. Nevertheless, a first wide scale deployment of miniaturized sensor technology. However, it looks like the scientists only track the trajectory of the bees using ‘e-tags’ (on the bees) and (potentially) readers dispersed in the environment. 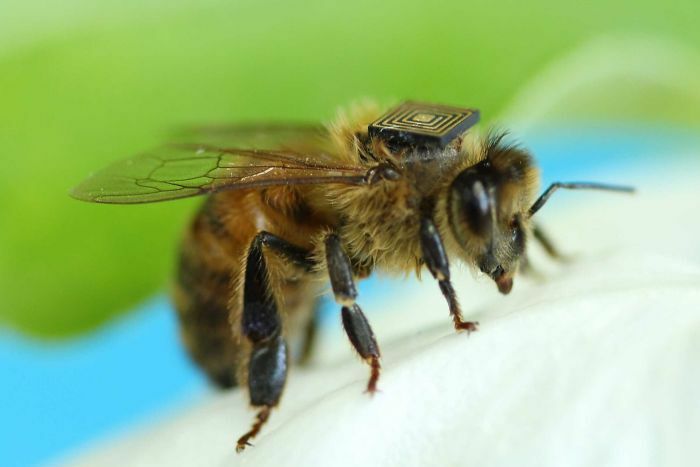 It is unclear if there are actually sensors on the bees that actively sense. “CSIRO is working with the University of Tasmania, beekeepers and fruit growers to trial the monitoring technology, in an attempt to improve honey bee pollination and productivity”. read more about the Australian CSIRO project here.